In a future where we no longer have the ability to dream, people have turned to ‘Fantasites,' genetically engineered wormlike parasites, for sleep relief. Delivered right to your door, these ‘worms' allow you to experience your wildest nocturnal fantasies by just dropping one in your ear canal right before bedtime! Charles [John Ferguson], a socially awkward young man, begins using this new miracle dream aid, hoping it will bring excitement to his mundane life and get him closer to the girl of his dreams. Soon, things squirm out of control for Charles and his friends, when the government bans the product and people seek the addictive ‘Fantasites' through underground illegal means. 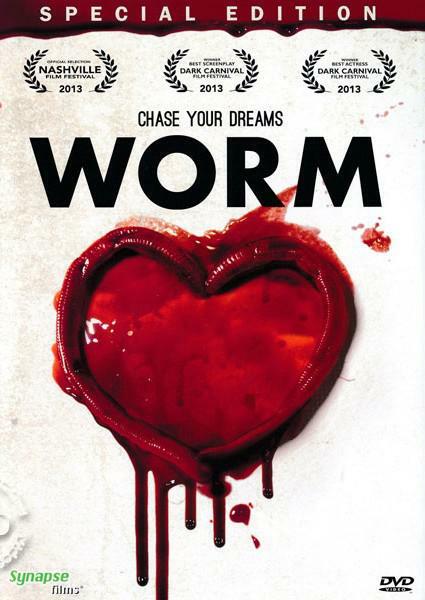 A fascinating, genre-bending, sci-fi thriller, WORM is an outstanding independent production that took film festivals by storm. Originally conceived as a short for Nashville's “48 Hour Film Project” (also included as an extra on this release), this feature-length version was developed without a written script and the actors improvised their dialogue during filming.